For reasons relatively easy to figure out, the massive flood of repo fails from a few weeks back was largely ignored outside of a few minor references. Not much has been made of it at all, and why would there be since it is really hard to shove the imbalance into “the narrative.” That isn’t to say that there haven’t been any attempts to provide the usual benign banality that explains why it just wasn’t worth noting. To the contrary, the absurdity of what was offered is itself noteworthy. As the world’s biggest bond dealers — including banks such as Bank of America Corp., Goldman Sachs Group Inc. and JPMorgan — struggled to get rid of the burgeoning pile of debt, the premium for the newest, easiest-to-trade Treasuries soared to the highest since 2011.  The firms’ efforts to hedge all the Treasuries collecting on their balance sheets also roiled the futures market and a crucial corner of the financial system where traders lend and borrow securities overnight. 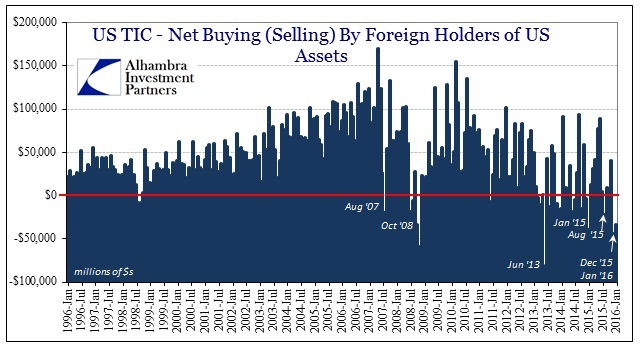 The existence of such huge inventories in the first place is apparently traced to foreign central banks “selling UST’s”, and thus these were dealers acting the good money dealing agents and providing liquidity in the greatest hour of need. Having absorbed all those “selling UST’s”, that created the immediate need to hedge against the unexpected inventory, spiking the premium in especially OTR (on-the-run) securities and thus leading to the dramatic collateral shortage that spilled into a 2008-style collateral run. To write than I am unconvinced is biblically understating my contempt for this attempt. The second part is even worse. These banks are supposed to have had trouble selling UST’s during a period when everyone was buying them? 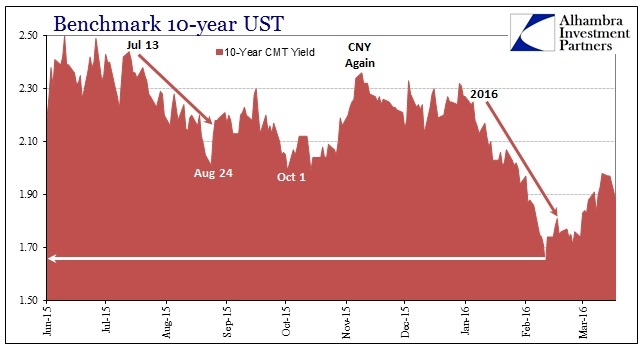 Even in the aftermath of the second liquidation phase, since February 11, all the benchmark yields remain subdued; meaning that there has been a continuous bid for UST paper both through the liquidation and then the partial retracement. To suggest these banks have had so much trouble offloading their “duty” of emergency support, to the point of being “forced” into worse and worse funding and hedging prices, does not just strain credibility it is patently absurd. 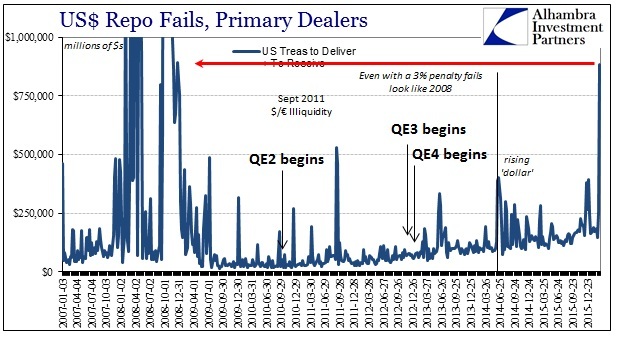 It is far more likely (and actually within the bounds of plain common sense) that dealers were getting squeezed for their other liquidity providing activities and positions and were instead “forced” to pay higher premiums for what looks more and more like a huge collateral call. If I had to guess, the reason they weren’t able to offload the imbalance was not because of lack of secondary market interest but more so that collateral in especially bad and increasingly sideways derivative positions becomes encumbered, and thus totally outside of dealer discretion. There would be additional multiplier and knock-on effects from there. 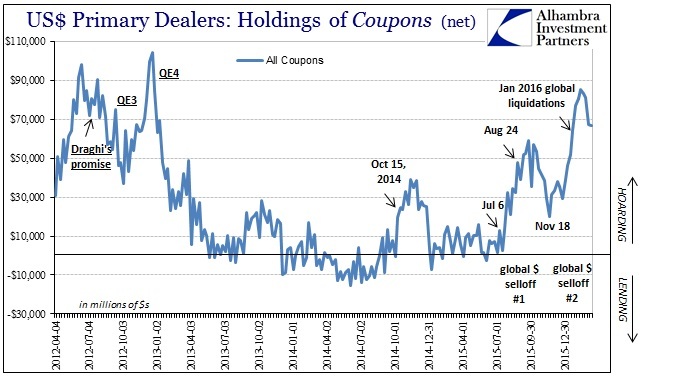 It is that factor which likely explains why dealer “hoarding” always seems to be clustered (not by random chance) around significant liquidity events (October 15, 2014) and liquidations (2011, August 2015, January 2016). There was only one asset class that was being especially bid during all of that, and it just happened to be the asset dealers were increasingly holding yet again. The problem with the absurdity is the usual kernel of truth that is contained within it. The TIC estimates for January do show immense “selling” pressure especially in the UST market and especially originating from the “official” sector. In fact, the “dollar” indications from TIC were as bad in January as anything we have seen before – which only matches what was witnessed during that month. It is in interpretation that irrationality follows. The cumulative net “dollar” selling (which includes more than UST assets, but is primarily that class) in December and January was almost $77 billion. That is an enormous deviation from “should” normally occur (but hasn’t since 2007). 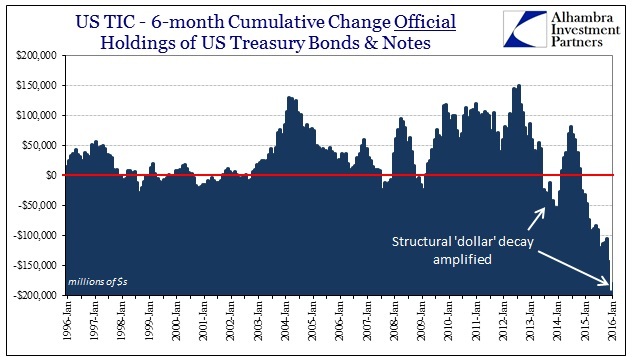 The last time TIC delivered such a huge two-month negative was the June 2013 “dollar warning” that accompanied the massive MBS rout and currency selloff, and then October and November 2008. Those are the only other two-month periods with such “dollar” abandon. The accumulated negative over the past six months for the official sector was nearly -$200 billion, a level never before seen, not even 2008, indicating a “dollar” funding gap so large as to explain why everything not nailed down (including the esoteric intricacies of the internal eurodollar mechanics; swaps of different varieties and all that) was subject to intense and sustained selling pressure. Under those circumstances, especially perhaps being caught on the wrong end of it, might explain why dealers were so intent on hoarding collateral and paying up for the “privilege” of doing so. Or it really was just dutiful dealers somehow experiencing immense difficulty selling UST inventory into a market with no shortage of premium buyers.